Valworx 523903A stainless steel full port three way ball valves are designed for use with water, air, oil, and other media compatible with the materials of construction. 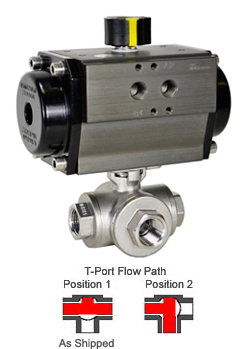 This diverter valve has a T-port flow pattern. There is no flow shutoff position with this type valve. Double acting actuators use an air pressure signal (80-120PSI) to change the valve to position 1 or position 2. Maximum working temperature of assemble is 180 °F. Order optional valve mounting kit to extend media temperature to 300 °F (suitable for steam up to 50 PSI max. with kit). Advantages of air actuated ball valves over other type valves may include: higher flow rates, higher pressures, higher temperatures, wider media compatibility, straight through flow path, reduced water hammer, and use in hazardous environments. Valve is tested per API 598, can be mounted in any orientation.